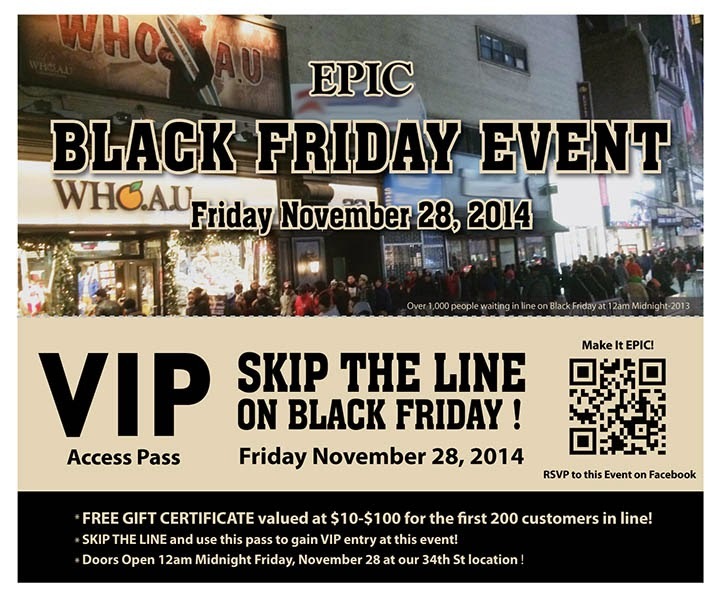 Deals abound on 34th Street for Black Friday! Below is a small selection; Happy Thanksgiving and happy holiday shopping! Macy's "Black Friday Give-Away with a Million Dollars in Prizes" begins 6 p.m. Thanksgiving evening. Along with Macy's unbeatable doorbusters and specials, customers will have the chance to unlock digital gift codes on an hourly basis, using Macy's mobile app while shopping in store. During doorbuster hours from Thursday to Saturday, Macy's will distribute one million dollars in digital gift codes to help shoppers nationwide save even more this season. In addition, SpongeBob SquarePants™ will join the Black Friday celebration, as a character in Macy's mobile app. 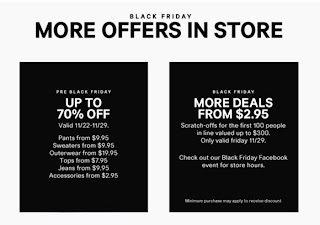 For more information about Macy's Black Friday event and rules, visit macys.com/million. Below are a couple of Macy's top Black Friday doorbusters, available while supplies last. Doorbuster hours are from 6 p.m. Thursday, November 27 through 1 p.m. Friday, November 28, and Saturday, November 29 from 7 a.m. to 1 p.m.
Open 6pm on Thanksgiving Day and staying open till 11pm on Black Friday. 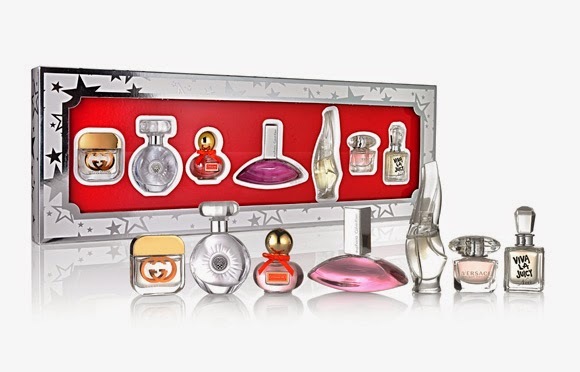 Free 7-piece mini-deluxe scent sampler with any $95 fragrance purchase. It's their best Jingle Sale ever! Click here for their Black Friday offers. Shop doorbusters from 5pm Thursday until 1pm on Friday. 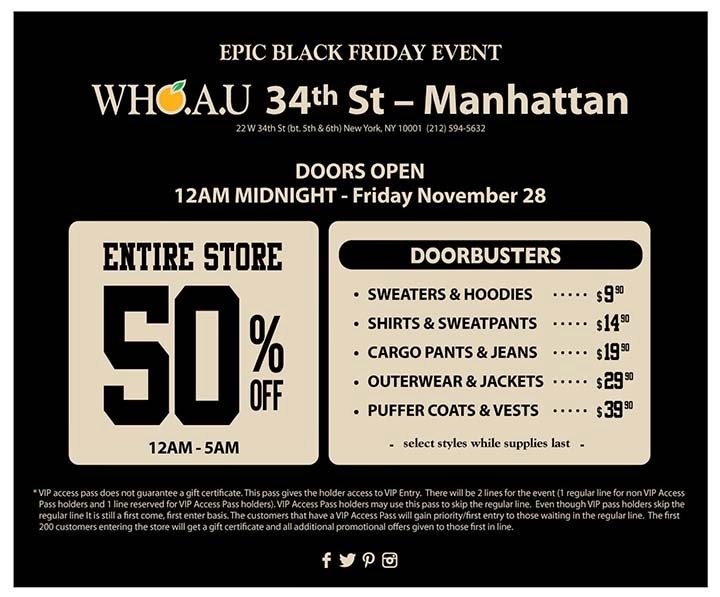 It's another EPIC Black Friday at WHO.A.U on 34th Street! Free gift certificate worth $10-$100 to the first 200 customers on line. Check out their Facebook fliers below, and be sure to use the pass below to skip the line and gain VIP entry. Pre-Black Friday deals are going on now, starting with up to 70% off. at $2.95 for accessories, and more deals from $4.95 on Black Friday. Also, the scratch-offs are key: first 100 people in line get a scratch-off valued up to $300.